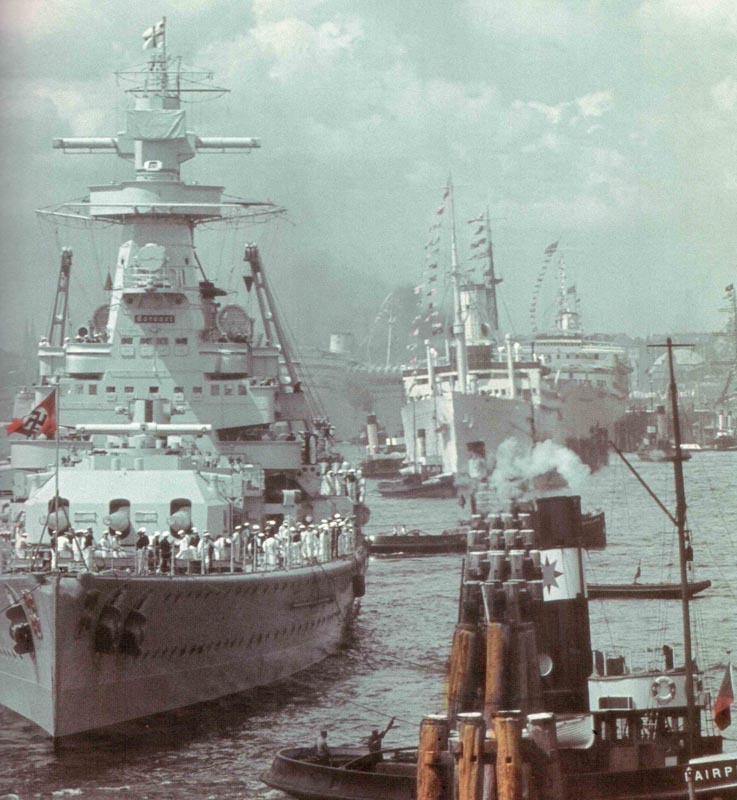 Pocket-battleship ‘Admiral Graf Spee’ pre-war in port. The Treaty of Versailles strictly limited the size of the German Navy and forbade the design or construction of submarines, aircraft carriers, naval aircraft or heavy coastal artillery. The displacement of new vessels was limited to 10,000 tons. German merchant fleet: 400 ocean-going merchant ships ( more than 3/4 overseas at the time of the outbreak of WW2 ). The German Kriegsmarine had been split up into 3 elementary arms under the control of a leader (Fuehrer) or flag-officer. The capital ships came under the straight order of the Oberkommando der Kriegsmarine (OKM) and then followed by group commands (Gruppenkommandos). The flotillas of patrol boats, coastal defence ships, minesweepers, and auxiliaries of all kinds and dimensions came under the naval security department. The last arm, which was to result in the most effective danger to the Allies on the ocean, was the U-boat command. 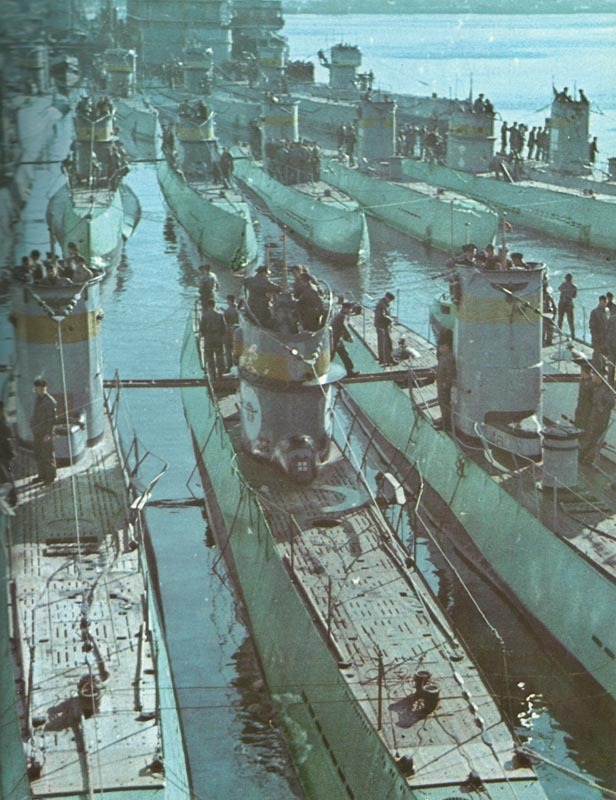 Type II U-boats from a training flotilla. Conscripts and volunteers undergone their elementary training in regiments (Schiffs­tammregimenter), while petty officers (Unteroffiziere) been given their training in NCO battalions (Marineunteroffizierlehr­abteilungen). A group of qualified personnel was kept in reserve units for mission whenever necessary. The German and occupied foreign coastlines had been protected by coastal artillery and anti-aircraft artillery battalions. There were no marine corps as. such and combat troops for com­bined operations or assignments on land were pulled either from the ship’s crew, or from the exercising as well as reserve units. By May 1941 the strength of the Kriegsmarine had reached 404,000 men in all ranks. In contrast to many of the other important navies, the Kriegsmarine was lacking its own planes. An Luftwaffe officer had been send to OKM and was in charge of giving the Navy with its demands in the air. The Fuehrer der Marineluft­streitkrafte was Major-General Geissler and either his planes as well as crews had been care­fully picked for the extraordinary duties they had to undertake. WW2 started with both outstanding results as well as serious setbacks. U-boats achieved their initial significant triumphs by sinking the British aircraft carrier Courageous and battleship Royal Oak, and magnetic mines introduced the British with an unpleasant if exclusively short-term surprise. Naval units enjoyed a significant part in the conquest of the Polish coastal citadel at Westerplatte close to Danzig; German vessels smartly carried German troops to Norway during Operation Weser Crossing and U-boats threatened Britain’s ocean-going life-lines. However in the process the Kriegsmarine lost 3 beneficial heavy cruisers as well as 10 destroyers. The crucial struggles of the sea war were nevertheless up ahead. 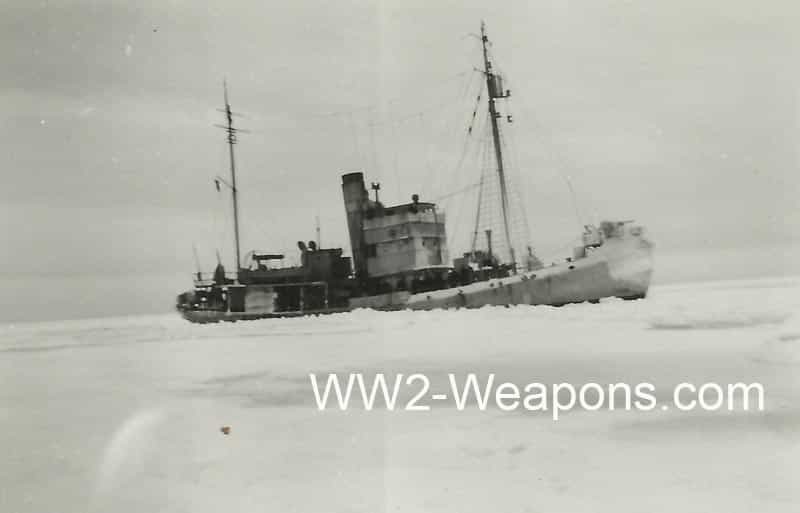 German minesweeper in ice seas off Norway in the winter of 1940-41 (photo of the grandfather of the author).